Now that summer pool time is in full swing for the boys (2-3 hours a day of swimming most days) I was amused to discover that last year's favorites were still their favorites - and that both dogs are so different in their preferences. As you can see, over the past few years they have accumulated quite the poolside collection! Murphy will reliably fetch an object once - maybe twice if the throw is greater than 20 feet (not enough work) but less than 50 feet (too much work)...Murphy is not so into retrieving for retrieving sake. I call him my "un-retriever". 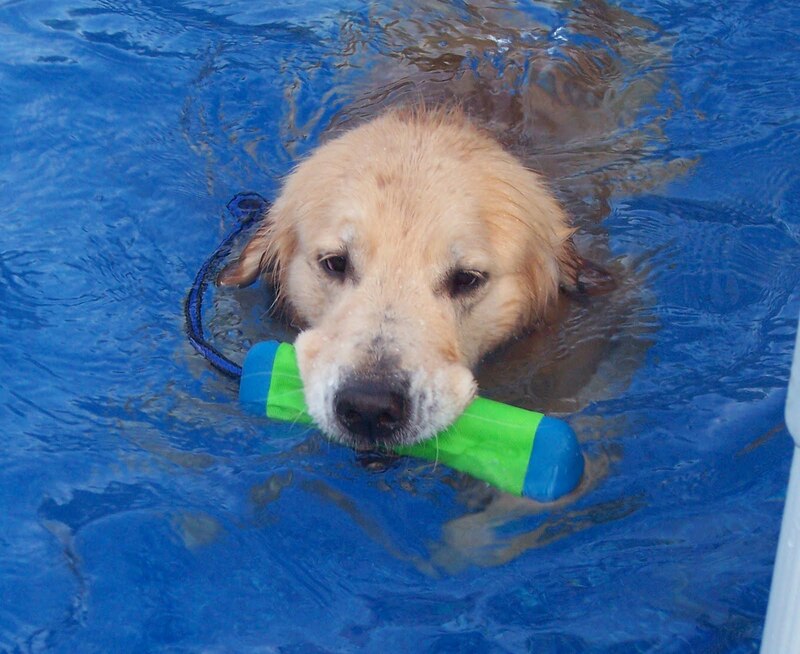 However, put him in the pool with the right object and he will happily swim back and forth for an hour (with a potty break or two) retrieving his favorite objects. What is Murphy's favorite object you ask? A stick. But not a real normal stick (eww dirty says Murphy) - a rubber stick. That's right - a rubber stick. Made by Ruff Dawg it's called "The Stick ", for the mighty-mites out there Ruff Dawg also makes a product called "The Twig " which is a smaller version of the stick. I bought one "Stick" for Kasei (many moons ago) and he hated it - didn't play with it - the novelty was purely mine. Murphy never cared for it "on land" either - I thought it was a total bust. 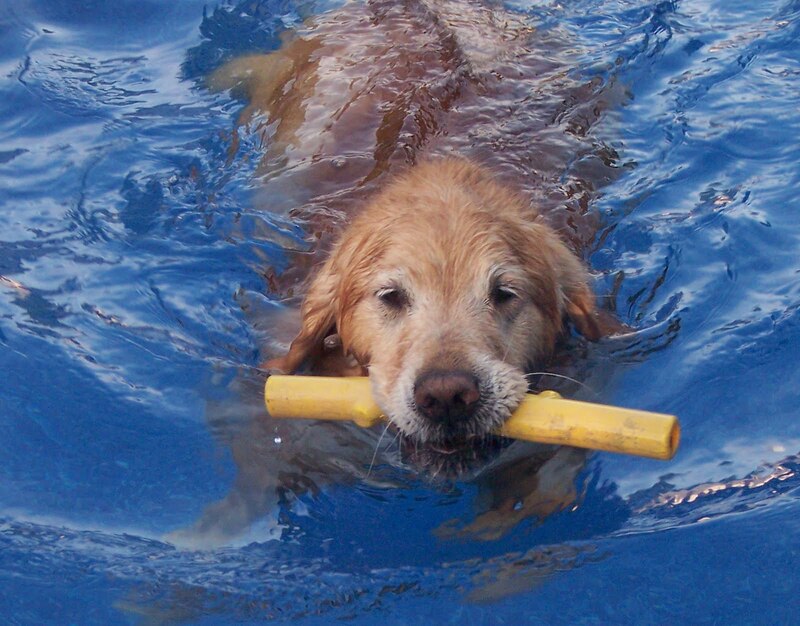 Last summer I discovered that The Stick floated and suddenly "The Stick" became Murphy's favorite pool toy of all. "The Sticks " have held up to chlorine, summer sun and teeth for two seasons now. My only complaint is that when thrown into the pool, are swum over or hit by current from the pool pump they tend to sink - while they eventually resurface I would not use these out in open water as they would get lost quite easily. I think the sinking quality of The Stick is part of the appeal for Murphy - he'll swim out to where the stick went into the water and then swim in circles waiting for it to resurface. The net result is that Teller often completes three retrieves for Murphy's one. Murphy gives "The Stick " two paws up. 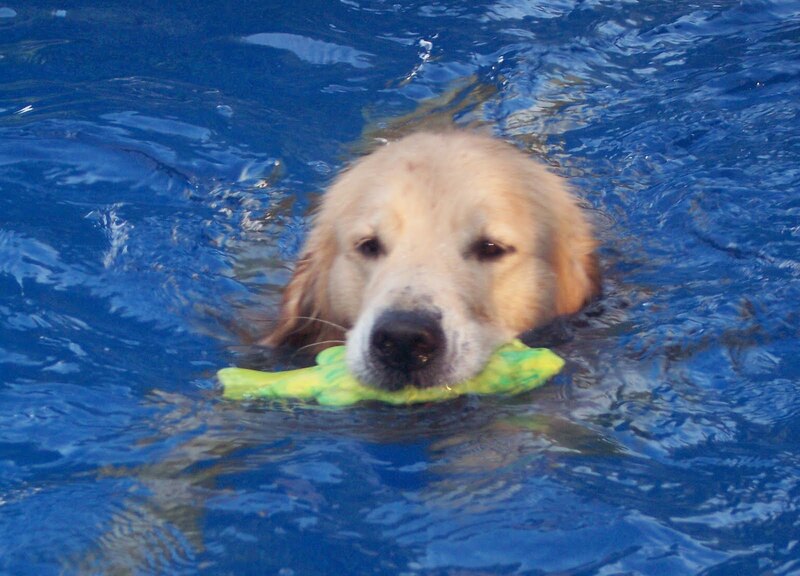 Teller's favorite pool toy! 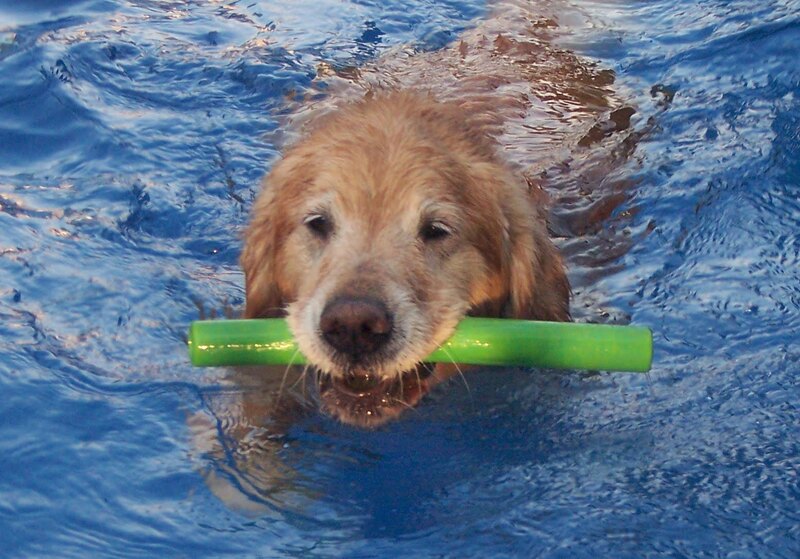 Not just for pools and other bodies of water, the ChuckIt Bumper is great for retrieves on land too - we always have one of these in the car to play with when we're on the road. I like that the ChuckIt Bumper floats relatively high in the water - as such I have no concerns throwing this one into ponds, lakes or streams. With the attached rope I can get good distance on a throw. Teller seems to prefer the size (or shape) of the ChuckIt Bumper over other similar bumpers. As for durability, both the bumper in car and the poolside bumpers have held up to almost daily abuse all summer and heavy use in the winter. Chlorine and direct sunlight have not impacted the look or feel other than a slight bit of fading on the older poolside toys. Teller gives ChuckIt's Bumper two very enthusiastic barks. Amphibious Flying Ring by ChuckIt! I picked up one of these ChuckIt Rings when they were on sale at Pet Food Warehouse - thinking that both dogs would like it. The ring is made of the same material as the bumper - with a rubber edge and the squishy bolster ring inside. The ring is easy to throw and also sits pretty high in the water (though not as high as the ChuckIt bumper or boomerang). 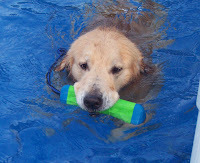 As it turns out the ring is the least favorite pool toy around here with my guys. 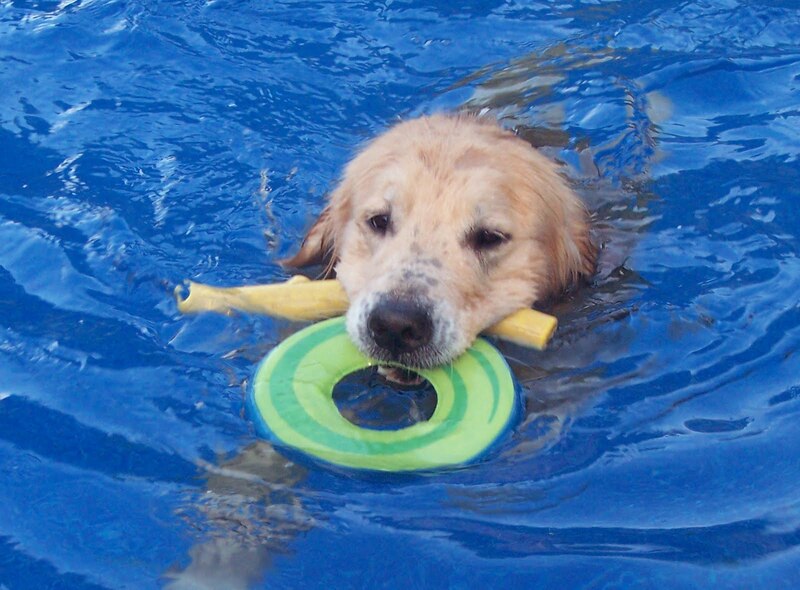 They'll retrieve it when asked - or if it's the only object in the pool, but if I throw ten toys in the pool the ring will be the last one they retrieve. As you can see in the demo picture on the left I asked for the ring - I got the ring plus a stick. We rate the Flying Ring an "ehhh....." - in other words leave it on the shelf. A new product from the folks at ChuckIt we bought a ChuckIt Boomerang off the sale rack at Pet Food Warehouse. I knew how much Teller liked his ChuckIt Bumper and also that they really aren't into their ChuckIt Ring - so with the Boomerang it could go either way. As it turns out, the Boomerang has more of a bumper feel and function than the ring. Like the Flying fish (below), the Boomerang when thrown properly (and it's easy to throw it properly) bounced (or skimmed) off the surface of the water and while not the most aerodynamic of the current stock of pool toys, I was able to send it about 50' on one land throw. ChuckIt's Amphibious Boomerang rating is "one paw up" from Murphy and a "Roo" from Teller. We received a couple of these as gifts one summer - I found that they really didn't hold up. The seams fell apart with limited normal use and our ring float disintegrated in a matter of two weeks without any real use or abuse other than direct sunlight - and remember we live in Vermont - we don't get THAT much sun around here even in the summer. Another "ehhh" and a recommendation to save your money and leave it on the shelf. Here's a surprise favorite. The "Flying Fish " was on sale at Pet Food Warehouse this past weekend (25% off is cool) and is made by the same folks who brought us Murphy's "The Stick". The flying fish is made from 100% rubber - it is heavy for its size and as advertised, it does float (belly up actually). The Flying Fish like The Stick floats low in the water and I wouldn't use it in larger bodies of water because the dogs really can't see it until they're right on it. Teller has pretty good marks when he's doing his water retrieves and can find it easily - Murphy is more of a "go out there and find it" kind of dog and I think that if he was in open water he'd spend way too much time trying to find a Flying Fish than I'd feel comfortable watching him circle around and around looking for it. The fun (for me) part of the Flying Fish is that if thrown like a slipping rock the Flying Fish will skim and skip over the surface of the water. Both dogs loved the real fishy action of the "Flying Fish". Murphy gives the Flying Fish two paws up and Teller ads his own "Rooo-Roooo" endorsement. We have a few of the Air Kong toys. Some with rope and some without . I've been disappointed with this line of Kong toys. While the classic bell shape kong is a go-to for eager puppies who need something to do, the Air Kong line just isn't durable or particularly exciting for the dogs. Even brand new out of the wrapper these toys will take on water and eventually sink. 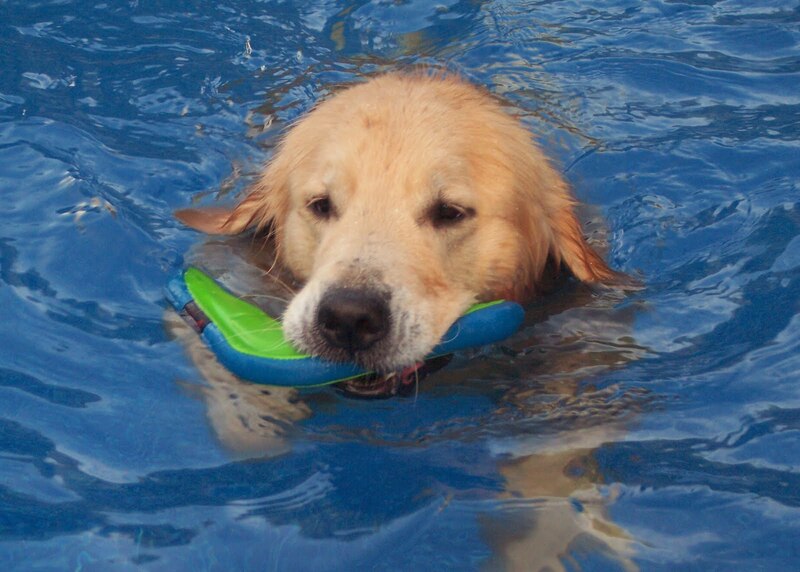 A pool toy that sinks to the bottom of the pool is not a fun pool toy. The rope on the Air Dog Fetch Stick frays when exposed to chlorine and sunlight and the bits of nylon actually go through the skimmer basket and into the filter. 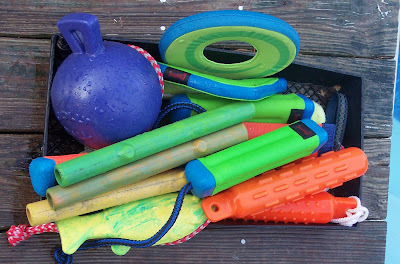 I've stopped using these toys in the pool. It's just not worth picking bits of nylon rope out of my filters or fetching (me) the skimmer wand to retrieve the toys off the bottom of the pool. I've been equally unimpressed with these toys as land toys as well - If you (or your dog) are hooked on felted rubber "tennis toys" it's easier (and cheaper) to just buy regular disposable tennis balls - or (my preference) some of the ChuckIt rubber balls . - We particularly like the blue ChuckIt Whistler balls for our land retrieves. As for the Air Kong line we're putting these squarely into our "don't even bother" column with a cavet that the Air Kong Squeaky balls are fun for the five minutes they last before they break and don't squeak anymore. I don't know about you, but I don't have extra dough to buy squeaky tennis balls that have a lifespan of 5-10 minutes - even if they are "BIG FUN" for those 10 minutes.